The memorial is the winning result of an enormous national architecture competition. In 2005, a design from Los Angeles-based Paul Murdoch Architects was selected from more than 1,000 entries. Murdoch and his team worked with the National Park Service and the family members of the Flight 93 victims to create and landscape the memorial complex and the 2,200 acres of surrounding grounds. The Tower of Voices will be the final element. Since many of the passengers and crew members on the flight made their last contacts with loved ones by voice, via in-flight phone calls, the tower will symbolically preserve those voices into eternity. 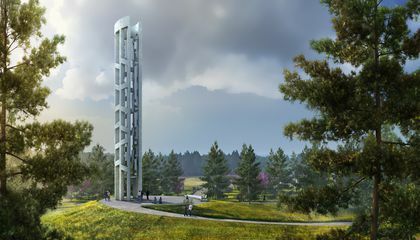 The tower will be made of precast concrete columns with branch connectors to visually tie the structure to the hemlock trees at the crash site. The structure is designed to optimize air flow, so wind can reach the 40 five- to 10-foot aluminum chimes inside. For architect Paul Murdoch, it was essential to create a design that would work with the surrounding environment, enhancing and contrasting with the natural splendor rather than attempting to overwhelm it. But building a 93-foot-tall musical instrument has been an enormous technical challenge. It’s involved the design and fabrication of chimes of a larger size and magnitude than currently exist anywhere else in the world. The process has brought together music theory experts, a chimes artist, an acoustical engineer, wind consultants, mechanical engineers and chime fabricators, among others. Using musical tuning theory, the team identified distinct tones for each chime, so that, when the wind strikes, the chimes will create a “conversation” of 40 unique voices. This meant understanding the wind direction and speed at the site, and how this would affect the sound–to figure it out, the team made recordings of chime mock-ups, used computational fluid dynamic modeling to look at potential tower shapes, tested chime configurations via acoustic simulations and used a wind tunnel to simulate conditions at the site. In winter, the wind can drive in at speeds up to 40 miles an hour, while other times of year bring much milder conditions. Murdoch and his team needed to test them all. Once the chime design was finalized, the chimes themselves needed to be cut and tuned. A Central Illinois instrument manufacturing firm won the National Park Service contract to cut, tune and assemble the instruments. “It’s a great honor,” said Brett Fugate, owner of Fugate Inc, which manufactures percussion, wind and brass instruments, speaking to a local newspaper. The chimes and the precast concrete elements are being delivered to the site this summer. The process, including chime delivery and erection, is viewable through a live webcam. The tower will be dedicated on September 9. The tower will mark the memorial’s entry and exit, and is meant to be visible from the nearby Lincoln Highway. Murdoch hopes visitors will experience the memorial in different ways, depending on their own backgrounds. “We very consciously tried to create an openness to the experience and interpretation for everybody, and not to try to dictate what they would feel, but to let everybody have different angles of experience,” he says. To Murdoch, the final memorial will be the fulfillment of a desire he had back on that terrible Tuesday in 2001, a desire to help – to do something.